For health and safety reasons the workshops are not open to public. Closed :First week in September. How popular is La Maison Du Biscuit? 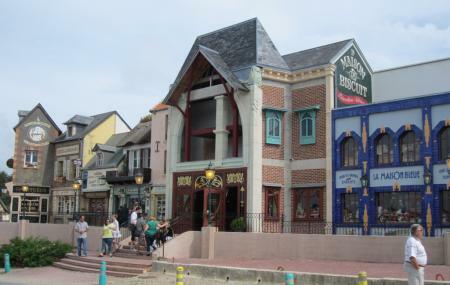 People normally club together La Cite De La Mer and Musee Memorial De Bloody Gulch while planning their visit to La Maison Du Biscuit. People also prefer to start their day with La Maison Du Biscuit. Nice interesting place with plenty of choice of gifts to take home. Busy but that’s always good although inside is dark it’s not always easy to see read and understand the labels. I came out with gifts for family and friends happy with my purchases. Very nice biscuits and baked goods. It is closed at some points in the week so do check before you visit. It is expensive but remember that these are artisan products and made from local ingediants on the site. As well as good biscuits they also have a good scotch whisky selection. Interstingly this is not as expensive as you may think. A treasure trove of goodies. Allow at least 1 hour to see all the different departments. You can make some fabulous hampers and gift baskets with the wide range of French produce. Great chocolates. The tea room looked inviting. Brilliant displays. Their butter biscuits are counted among the best biscuits I've ever had. The little house is a bit of a trek to get to, but once you're there you'll be glad you did. Apart from biscuits, there are all sorts of things to buy including stuffed toys, artisan chocolates, organic products and surprisingly, a range of exotic spices that I couldn't find anywhere else in Cherbourg. It's a great family day out and there's even a tea salon where one can test the goods before you buy a box of whatever. Fabulous place. Definitely worth a visit. I have no idea how to adequately describe it other than an emporium.